They are not changing much. The opposition inexplicably refuses to take a wholesale sweep at the "comunas" ambitions of the regime, which is nothing less but an attempt at destroying whatever is left of democratic practice in large areas of the country. This would be achieved by gutting power from locally elected authorities and introducing public and/or indirect voting ensuring that more than half of the people of the country would never dare vote against any of chavismo proposals. Instead the opposition is pursuing a potholesque campaign Capriles style. The same result should be expected except that now that Chavez is reelected there may be enough chavistas willing to consider voting for an opposition governor more likely to pay attention to them. The more so that it is painfully obvious that chavismo leadership is infinitely more worried about Chavez health than pothole fixing. Which one is more important in the mind of the chavista voter that the opposition needs to win over? Impossible to measure. Here chavismo had a problem because too many military, too many out of towners were nominated in states where they did not reside. The base was resentful and vocally so in many states. Still, with the powerful electoral machinery set in place for October 7 and a few well calculated Chavez support visits, this could have been overcome. At least for states like Aragua or Bolivar. Now that Chavez not only did not make any appearance since October 7, but will not make anyone until December 16, that chavismo strategy may come in to do some serious damage even if the opposition does not manage to rally its voting base dispirited since October. On the other hand, playing the emotional card of a sick Chavez and pity vote could rally a not insignificant amount of chavistas. But then again, they resent having been forced to vote for Chavez in October and if he is sick, why bother... Etc. You see what I mean, it is very hard to see what plays more here, if chavismo wins or lose more with the utter absence of Chavez coupled to his renewed disease. Are these people going to be as easily blackmailed this time around? There is no way I will make predictions. And there is no way I will believe polls which many of them have proven to be so wrong at local levels pre October (anyone from Datanalisis reading?). Still there is what we could call "trend" information available, as well as the individual work made by the different candidates, the opposition ones apparently working much harder anywhere than the chavistas one, too trusting on a Chavez coat tail that in my opinion is threadbare at best. Thus in lieu of any prediction I have revamped a previous post over a week ago where I described the possible scenarios and what they would mean in the table below. I am using again a regional distribution of the states for clarity. The first column is my pessimistic view today, which remains unchanged from a week ago. The difference is that I have put in green the states that are up in the air due to Chavez missing. As you see I think that the October 7 result and the inadequate response from the opposition (still to this date!) promise it 3 states and maybe 3 more. Then I describe an evolving scenario where the opposition vote improves. That improvement is very uneven and does not happen in every state. But since I have promised that I was not covering these elections in the usual detail I have done in the past, you will need to accept it as I write it. Simply put: there are states where no matter what happens with Chavez and no matter what candidate he sends, will vote red. In others states a good campaign and doubts about Chavez can change the result. And I am not entering into the detailed consequences of inner divisions here and there. Here is the consequence of my grim view of the situation. The opposition wins only 4 states: the three in blue and one of the 5 in purple. With such a result Chavez can dare to prepare his succession. We enter an "out of the closet" dictatorship. Here depending on how the exact results are we can say that the opposition resisted the chavista post October onslaught or that even a new status quo is set where Chavez can keep advancing but where the opposition can block a measure here and there. On the long run it is of course a chavismo victory through a war of attrition, but a definite exit of Chavez can mean new options for the opposition. Here the opposition wins 5 states in blue and at least one of the toss up states in purple (by Xor Y I mean toss up, too close to call states). Right now I think that one of these two scenarios is the more likely to happen. Here, clearly the opposition has benefited from the absence of Chavez in the campaign But the electoral machinery still worked enough for Chavez that chavismo got a majority of the states. However by first retaining all the states it had (Carabobo?) and gaining a couple of states the opposition made chavismo suffer a set back. This is enough to block for the time being any unconstitutional change though through treachery and a war of attrition chavismo will still try to gain the final upper hand. In short, this result means that more than half of the people of the country will be ruled by opposition governors and as such the October 7 will be partially annulled. We cannot rule that out. With a Chavez absent, with his appointed candidates floundering, there is a real possibility, though very small I think, that the opposition may "reverse" the October result. This means that the opposition wins the 9 states in blue and at least 2 of the purple ones, preferably Aragua and Bolivar. Still chavismo would be winning one state more than the opposition but all the big ones being in the opposition hands the consequences would be clear for all parts: as soon as Chavez dies or resigns there is no certainty as to the result of the new presidential election. And chavismo can forget about changing the Constitution. I really think that 11 states is the best the opposition can do: the chavista machinery is too strong and the vote too dependent of social programs to go further than that as long as Chavez is alive. We learned that on October 7, the Venezuela version of Romney's 47%. However I have indulged in a "game change" scenario, the result we should see if we want to see a prompt and peaceful departure of chavismo from office as soon as Chavez is out of the picture. One can always dream, can't we? Again: these are not predictions and it is very unlikely that this time around I'll make any prediction. However I reserve the right to modify this table once more before December 16 as I am keeping an eye on Falcon, Carabobo, Aragua and Bolivar where the electoral dynamic can change the most in the last two weeks of campaign. At this point with Chavez "mas de allá que de acá" predictions are futile [more there than here in a macabre way]. Margin annotation: written while listening to Bruckner 8th. 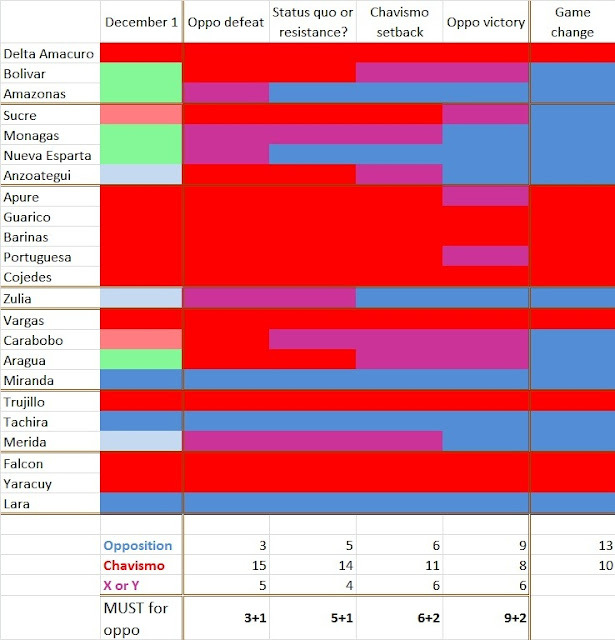 If the oppo had done a good job after their 7-O loss, I would bet my money on "oppo victory", hence, I'm more on a "resistance/setback" kind of mood, I think that the oppo has realistic shots at 7 states ("Sure": Lara, Miranda and Tachira, "Maybe, leaning oppo": Zulia and Carabobo, "with luck" Anzoategui and Nueva Esparta) and MAYBE (font size 128) amazonas and bolivar. There is also "disaster scenario" where we get 3 or less. But I think it unlikely now. maybe my writing days are not over. Difficult to retire a fire-horse when there is smoke in the air. Brukner's 8th? Getting in form for the Apocalypse? Buckner is more than for apocalyptic moments. Here is my motto, never revealed before in public. so if you're looking for the answer to life's questions, all you need is BS. Pretty much. That is why chavistas are so happy, no need for Bruckner for them, plenty of BS from the big Ch. Sibelius was a Cassandra of sorts. Lara is far from won. Reyes Reyes seems to have a big war chest and the average guaro is "platero". Not to forget that the big fraud machine is still in place. Cross your fingers. I am not saying that it a walk, but Lara seems as sure for the opposition as anything can be sure these days. "maybe my writing days are not over"